The Davidoff Churchill’s collection, an exceptional cigar for an exceptional man. Winston Churchill was definitely one of the key people of the 20th century. His personality as a man, his role as a politician completely shaped his time. He had 3 passions in life, aside of his career: painting, writing (he got a nobel prize for literature) and smoking cigars. Rare was a photograph of Winston Churchill without a cigar in the hand or in his mouth. Some pictures are iconic like the one at the end of Second world war at the Yalta conference. We can see in the first row, Churchill with his cigar in the hand, Roosevelt and Stalin. Iconic. Celebrating one of the biggest cigar fans, Davidoff dedicates an entire cigar collection to Winston Churchill. The new collection will be available from March 2015 in all official Davidoff stores and point of sales. It reflects, not only the name of Churchill but also his complex personality. A masterpiece in the Davidoff amazing story. Davidoff, a great success story around the finest tobacco. Zino Davidoff was born in 1906 in the Russian empire as his family was originally from there (Ukraine actually). His family decided to move to Switzerland as the political landscape in Russia was pretty much instable at that time. By settling down in Switzerland, the Davidoff family started a small yet successful business of fine tobacco trade. Zino Davidoff went to Latin America where he spent 2 years in the tobacco plantations. He learned all the aspects of the tobacco business from the raw material (the tobacco plant) to manufacturing process and commercial aspects. Returning to Switzerland around 1930, he took over his parents tobacco shop. What had originally been a modest tobacco shop grew into a rich business during and after World War II. Neutral Switzerland was spared much of the havoc wreaked elsewhere in Europe and became a haven for wealthy tobacco customers. Zino was particularly successful in marketing the Hoyo de Monterrey Châteaux Series of Cuban cigars created for Zurich cigar distributor A Dürr Co. in the 1940s and named after great Bordeaux wines. Around this time, Zino is also credited by many as having invented the first desktop cigar humidor, in order to preserve cigars at the same conditions of humidity and temperature under which they were rolled in Havana. Davidoff also had success writing several books on cigar smoking and Cuban cigar brands. In 1970, Zino sold his small but highly successful tobacco shop in Geneva to the Max Oettinger Company. Zino stayed on as Davidoff’s ambassador until his death in 1994 at the age of 87. He was survived by his wife, a daughter and his three siblings. The Max Oettiger Company, which took over Davidoff, was founded in 1875 and was one of the first importers of Havana cigars to Europe, selling its wares in France, Germany and Switzerland. The Oettinger Davidoff Group owns the worldwide Davidoff trademark for tobacco products other than cigarettes. Davidoff cigars continue to be produced in the Dominican Republic, under the direction of cigar blender Hendrik “Henke” Kelner. Since moving to the Dominican Republic, most of the vitolas were retained, although the Chateaux series was renamed the “Grand Cru” series and the names switched from wine estates names to simply numbers, and the Dom Pérignon was discontinued. 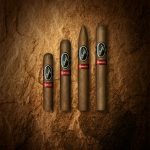 Davidoff has also added an Aniversario series, a Millennium series, and a Special series of figurados to its lineup, along with numerous limited edition and yearly special releases. Davidoff also produces a line of cigars known as “Zino” and a line of cigarillos. Winston Churchill and his cigars. There is one single object completely attached to Winston Churchill image, it is his cigars. Every where he would go, the cigar would be his companion. Several pictures of that time, would show Churchill with a cigar in the hand or in his mouth. It is completely part of the character of Winston Churchill. Perhaps no political figure is more readily associated with the enthusiastic and regular enjoyment of cigars than Churchill. Few informal photographs show him without one. And when a London cartoonist depicted Churchill as a tommy gun-toting gangster, he dubbed him “Cigarface.” Throughout most of Churchill’s political career, he was inseparable from his cigars. And he went to great lengths to make certain that he would not have to abstain needlessly, even for short periods. On one occasion, while serving as prime minister during the Second World War, he was to take his first high-altitude airplane flight in an unpressurized cabin. According to biographer Gilbert, when Churchill went to the airfield on the evening before the flight to be fitted for a flight suit and an oxygen mask, he conferred with the flight expert who was to accompany him on the journey and requested that a special oxygen mask be devised so that he could smoke his cigars while airborne. The request was granted, and the next day Churchill was happily puffing away at 15,000 feet through a special hole in his oxygen mask. Churchill typically smoked between eight and 10 cigars per day, although he did not constantly smoke his cigars but often allowed them to burn out so that he could chew on them instead. In this manner of consumption, the cigars often became mauled and frayed. To address this problem, Churchill devised what he called a “bellybando,” which was a strip of brownish paper with a little glue on one end. To prevent the cigar from becoming excessively moist and to keep it from fraying, he would wrap the bellybando around the end. There is only one Winston Churchill. There is only one cigar to bear his name. Davidoff brings you an exceptional new Winston Churchill cigar a blend as complex as the man himself. A range of the finest cigars inspired by the iconic aficionado, each celebrating a different aspect of his richly complex character. In this collection, Davidoff master blender, picked up carefully each tobacco quality in order to match each facet of Winston Churchill personality. It is an amazing work of precision, quality, refinement and taste. At Luxury Activist, we received a Discovery set presenting all the cigars in the Winston Churchill collection. We could enjoy all the finest and subtle details put in the handmade manufacturing of these cigars. These are probably the finest and positive complex cigars ever made. Each one is a olfactory and taste discovery, inviting you step by step into Winston Churchill amazing personality. ​The Winston Churchill Petit Corona is the shortest cigar in the range. Due to the smaller RG and the size, this cigar feels stronger and delivers less pronounced flavour nuances in the body. Beautiful pepper flavours together with dark coffee and toasty notes are dominating. Available in boxes of 20 Petit Corona cigars. Carrying the largest ring gauge in the Winston Churchill range, it is a grand cigar, from the first spicy, leathery, woody notes through the creamy, sweet influences of the Mexican binder to the final triumphant mix of flavours, courtesy of the Nicaraguan filler tobaccos from Esteli and Condegas. Available in boxes of 20 Toro cigars. As you can see, each cigar has a meaning and a purpose. It is a complete overview of the finest tobaccos. They are all handmade as all Davidoff cigars and gives you a world tour of tobacco. You can read more about this outstanding collection by visiting Davidoff official website. You can also find there how and where to buy it. When an amazing and true story inspires the making of exceptional products only the best can be achieved. Davidoff remains loyal to his tradition of quality and beautiful cigars. Info sourced at Davidoff official communication release and website, wikipedia and cigaraficionado.com. All content is copyrighted with no reproduction rights available. Davidoff Yamasa, exceptional new Cigar. One of a kind.